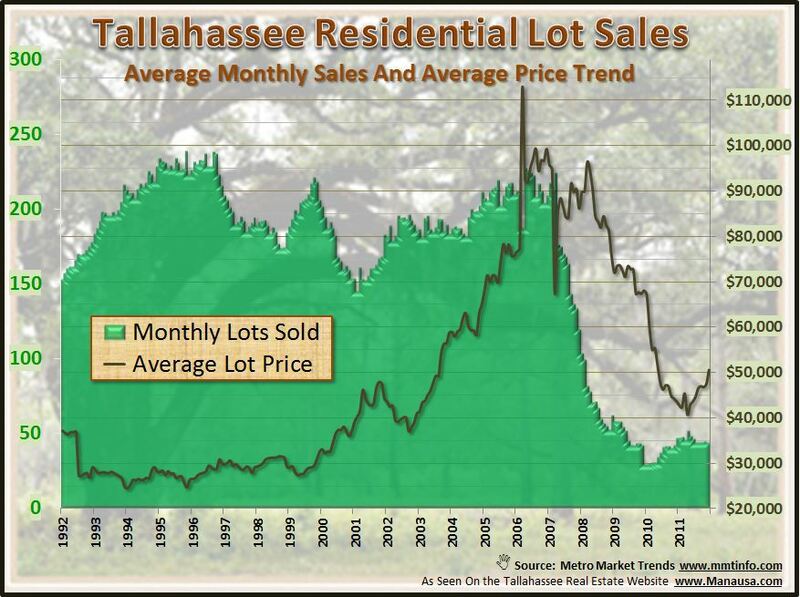 The price of developed lots in Tallahassee has moved all over the place during the rise and fall of the housing market. When I started in the real estate business in the early '90s, Florida was just emerging from the inception of the Comprehensive Land Use Plan that resulted in many land-owners bringing residential lots to the market. This created a glut of developed lots and land for sale that was so immense that we did not see any real movement in land values for roughly 15 years in Tallahassee. Two years ago, I wrote a blog that showed how to decide whether to hold or sell a residential lot, and it looks like the market is currently performing as we expected. The real estate graph below shows both the one-year trend of average lot prices (brown line) as well as the one-year trend of monthly lot sales (green). Look at how different the 1990s were compared to the past ten years. In the ‘90s, lot sales were fairly consistent, with a typical month recording more than 175 sales. The glut of developed lots that were thrust on the market in the early ‘90s as a result of the new Comprehensive Land Use Plan kept prices very stable, with average lot prices bouncing around just under $30K. That’s when the perfect storm hit. The inventory of post comp-plan developed lots was extinguished, money flew out of the (tech bubble) stock market and into real estate, and everybody wanted more homes. The average price of a residential lot soared to over $112,000 in March of 2006 and all was good in the world of land development … until the crash. Very few lots are selling these days, with the current trend recording just an average of 42 lots selling each month in 2011. I know there are some developers and investment groups sitting on large inventories of developed (or partially developed) lots. The banks have no desire to foreclose, because many of these lots and small parcels of land have no current value, as all buyer activity has ceased. Once we consume the glut of homes for sale and new construction renews, then we'll begin to see a growth in the demand for lots and land. So long as banks don’t flood the market with their large inventory from failed lot developments, we might see prices remain stable as we work through the glut of lots over the next ten to twenty years.